We served a meal. We blessed the truck. The first time out is exciting and crazy and filled with adrenaline. Now, to keep the penny shiny, or at least not too dull. We had fun and laughed as we cooked. I had dish duty. Wonderful to have a community that takes care of what needs to be done. I’m just there to lend some good order. 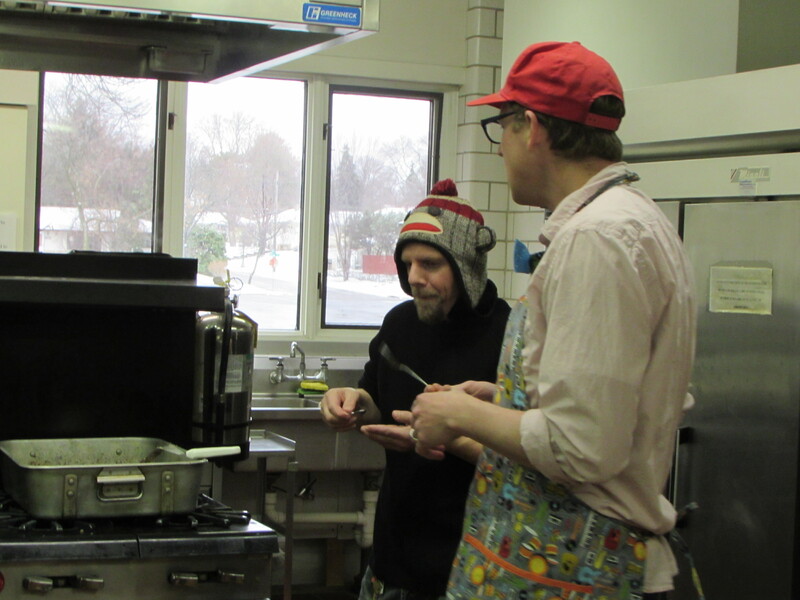 The wonderful people at Gustavus Adolphus Lutheran Church in St Paul allowed us to crash their Maundy Thursday and use their kitchen. We are still working out the details of our long term relationship, but it was a beautiful start. We were greeted warmly and led straight to the kitchen. Despite the hectic schedules of Holy Week, no one was too busy to answer our questions, to come visit with us, or to welcome us into their home. We realized there was a glitch with the dough. We had rolled it out early and it had stuck to the paper dividers. We scrambled to re-roll the dough and get it ready for filling. It meant we were 30 mins late for our appointed time to start serving. But, the reality is, no one was expecting us this first time. We were merely late for our own party. We served delicious food and chatted with all our guests. And then, we blessed the truck. We read from scripture the story of Shobi and his abundant table. Second Samuel 17. We heard how he provided a good meal and hospitality to an unexpected person. We blessed the space in which we gathered for meal and fellowship. In other words, we prayed a blessing on the sidewalk and the outdoors. 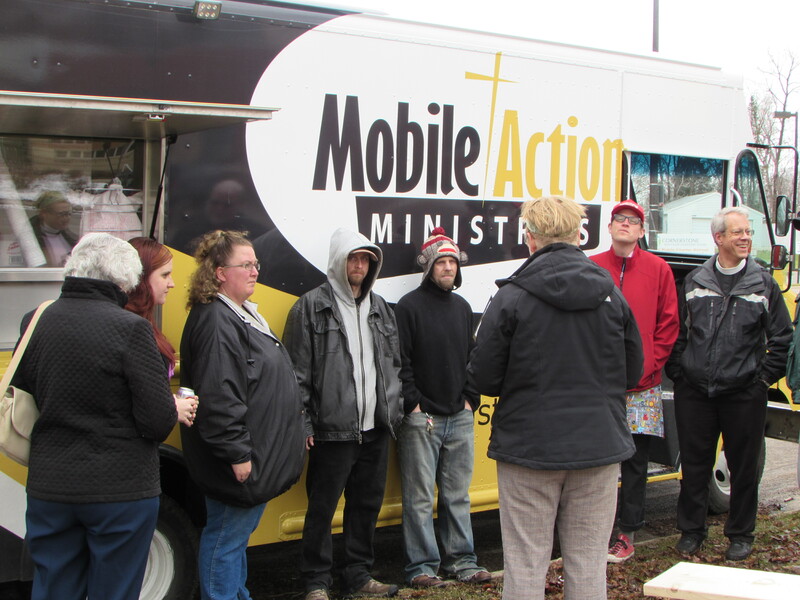 We then blessed the kitchen and the truck that allows for us to do this ministry in a creative way. 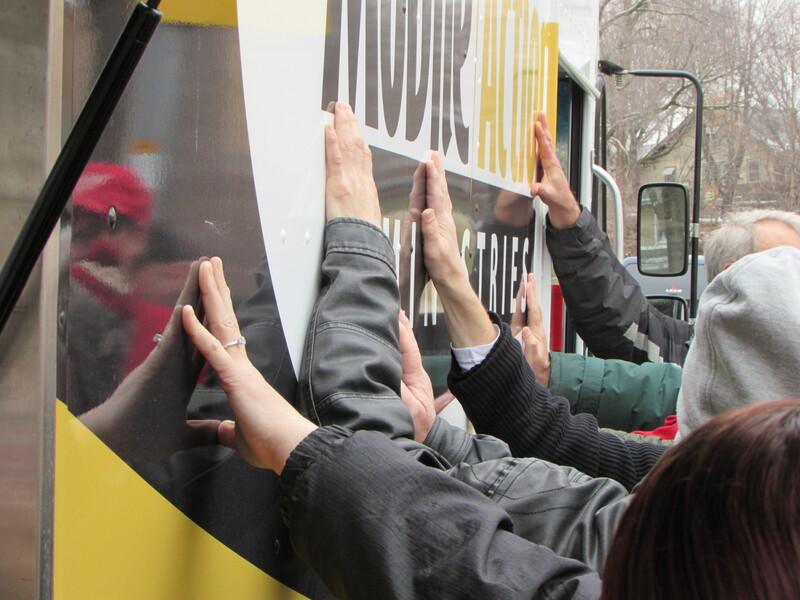 We laid our hands on the truck and prayed for all the work that will happen on it. And then, my boss man, AKA the Rev. Paul Erickson, invited all those who had come to share our beginning to lay their hands on those who are members of Shobi’s Table. He prayed for us and the ministry we are called to do. A simple beginning. Some food, some prayers, some minor glitches. I suppose that is how all things start. In this season of Easter, the road to the Cross and resurrection began with a baby, born to a family that encountered the glitch of no room in the inn. I think we are in good company.